In new colours for 2013/14 , Ocean Racer is a revolutionary design for high performance paddlers - shirts off paddling has never been so comfortable. The Ocean Racer is a new concept PFD which moves and stretches with you as you paddle. Using composite materials we have been able to introduce high performance polyester for comfort and stretch yet maintain the hardwearing ripstop where it counts. 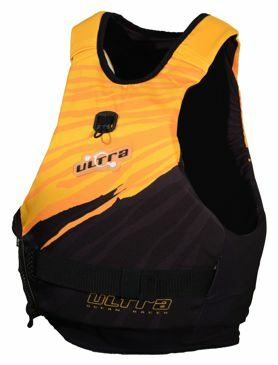 This elite PFD is feature filled with built-in hydration pack pouch including tubing shoulder guides and mouthpiece retention system and a handy hidden stuff pocket with lanyard clip. The internal belt system is enhanced with the hidden SOFTLOC buckle sheath reducing the chance of catching or scratching your craft.